For the past month we’ve had the absolute privilege of living under canvas in the beautiful Lake District. We’ve walked, climbed, explored and – joyfully – run every day in this astounding, breathtaking and challenging place. We kicked off our Cumbrian experience with a week in Eskdale: a peaceful corner in the south-western corner of the National Park where rugged mountains edge the picturesque River Esk, alongside which runs a quiet lane that eventually climbs steeply to snake its way over the Hardknott Pass. 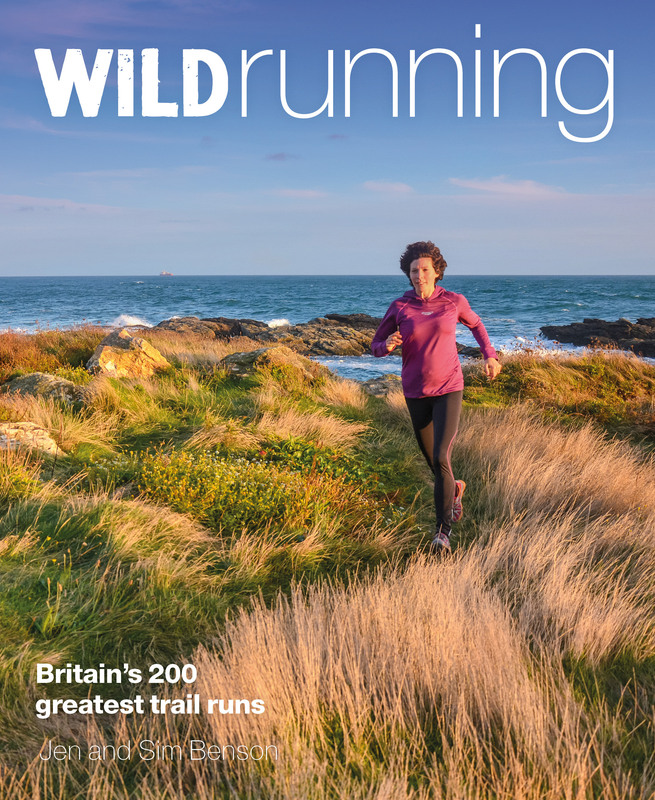 The result is fantastically varied running, from high ridge-lines hiding gleaming tarns to gentle riverside trails; from scrambling and scree-sliding to some of the toughest ascents you’ll find anywhere in road running. 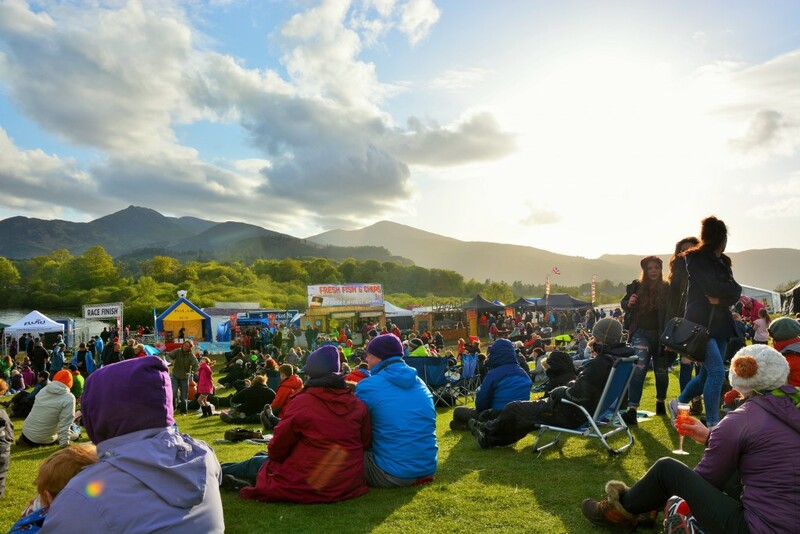 We then headed over to Keswick for the annual Mountain Festival, spending the weekend camping in the friendly festival campsite, chatting with lots of exciting folk from the outdoor world, listening to music and delivering a talk in the giant tipi on our adventures. “It’s cold and clear in the valley but misty up on the mountain; I wonder what it will be like on top. I run the first kilometre down the lane and cross the quiet main road; it’s a nice easy start and my legs are waking up as I reach the fell and leave the tarmac. It gets steep straight away and I’m soon blowing hard and trying to decide if a fast “hands on knees” power walk is faster than the quick but short strides I’m doing. I switch between the two up this steep bit towards the col where I know that I will be able to extend my stride and improve my speed. The path from the col to the bottom of Sharp Edge is great: short ups and downs keep the speed high and propel me along the contour until I hit the steps that deliver me to the tarn just below the Edge, which rises up in front of me before disappearing into the mist. I start scrambling, trying to stay on the sharpest bit – on the very edge – for the exposure. I enter the cloud and my world shrinks to a blurred bubble of a few metres. Amusingly the exposure goes away; I know that there is a drop on both sides but as I can’t see how far it is my brain doesn’t worry. I carry on up, jumping gaps, balancing along the edges and scrambling up the steep bits. At the top of the edge I pause and use my compass to check that the path goes in the right direction. I can run again and although it’s still uphill I can move fast across the plateau towards the summit. At the OS marker point I check my compass again and head down across the steep side of the mountain. 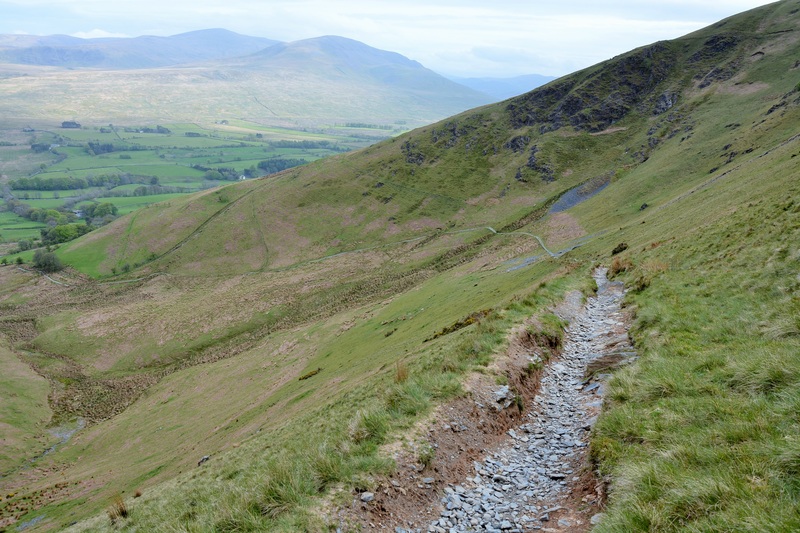 The descent is fast – a wide zig-zagging trail falling down to the valley below. I have to brake hard for the switchbacks and run the racing line, kissing the apex of each corner like a racing driver taking the fastest route. I arrive back at the gate and the lane with burning quads and a huge smile. Magical Ullswater was next. We explored its edges on foot, running the rambling, rising-and-falling trail along the lake’s eastern shore for a wonderful 10 miles before catching the steamer back and seeing it all again, this time from a completely different perspective. The striking Roman road of High Street runs along the long ridge above the lake here too – another outstanding run with panoramic views. Then – finally – on to the majestic Langdale Valley and the countless challenges that called to us from all around. We stayed at the National Trust campsite at Great Langdale; a perfect base for exploring the area, with fresh croissants for breakfast! The Langdale Pikes on the opposite side of the valley to the campsite make for an enjoyable but hard outing; Side Pike is a perfect easier summit – only some 3 miles out and back from your tent with straightforward route-finding and a great view back down onto the campsite. 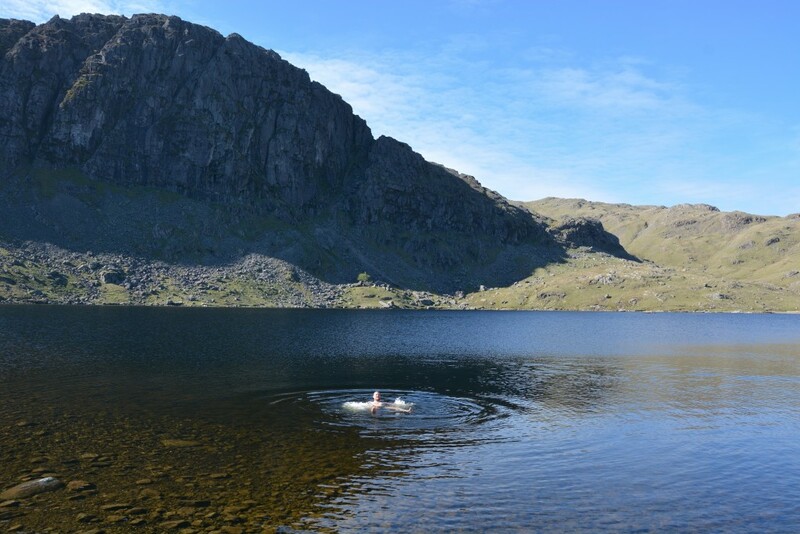 The long climb up Dungeon Ghyll to pretty Stickle Tarn, with the grand scoop of Pavey Ark above it is a tough start to a run, but on reaching the tarn you can take some fantastic higher-level trails such as the one up to High Raise for some of the best views to be found in the area. You can even climb an easier route up the legendary rock climbing crag of Pavey Ark along the wonderful diagonal line of Jake’s Rake: a Grade 1 scramble that’s fun for the sure-footed in dry weather. The new multi-user trail that heads towards Ambleside from Great Langdale is also a fine run, and relatively flat too. 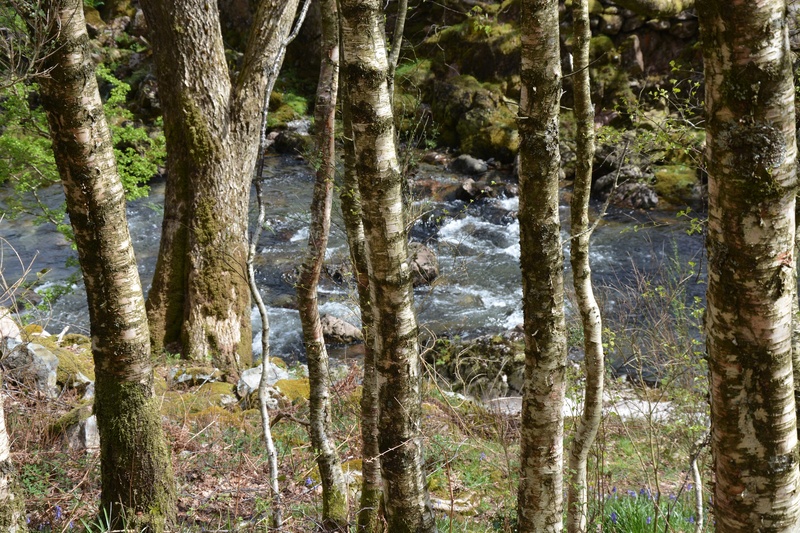 It winds through gorgeous woodland (bluebell-carpeted when we were there) and alongside the River Brathay into the pretty village of Elter Water. 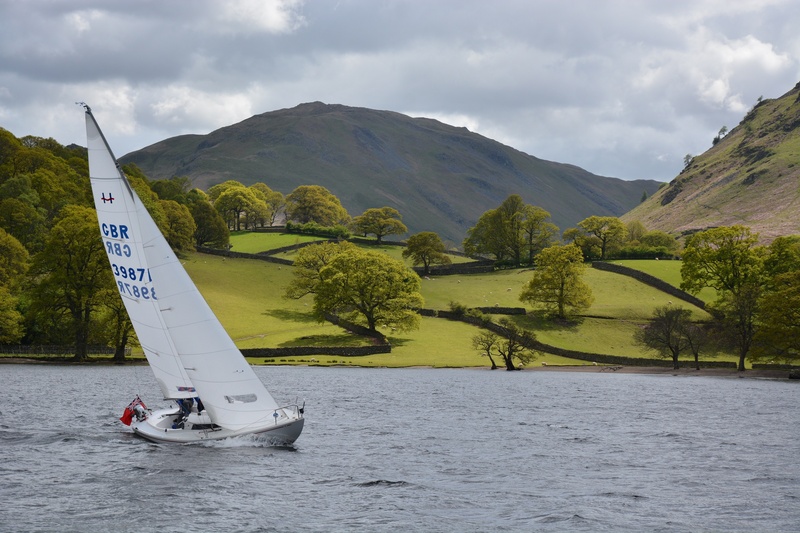 From this picture-perfect campsite that lies right on the edge of the great, gleaming expanse of Ullswater, follow the eastern edge of the lake along the lake shore path for 10 miles to reach Pooley Bridge at the opposite end. The route passes through How Town where there is also a steamer stop if you want to vary the run – these are a great warm, dry place to wait with decent coffee and free wifi! We included this route in our book, but it was so good we had to include it again. Here are the full route details, including mapping and .GPX. The friendly Camping & Caravanning Club campsite at Troutbeck lies at the foot of Blencathra: an awe-inspiring mountain that draws you to its great slopes. 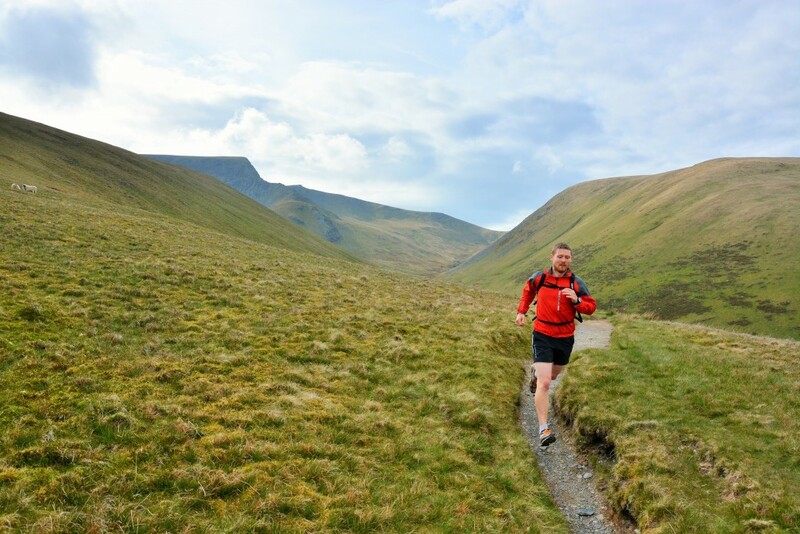 We spent much of our time here exploring the mountain, but for gentler days there’s lots of enjoyable, peaceful running in the valleys around Blencathra too, accessible directly from the site. Sim’s run crossed the A66 (caution) and followed the obvious path through Mousthwaite Combe to reach Scales Tarn and Sharp Edge, scrambling this to reach the summit. The main path heads west from here back down to Mousthwaite Combe and crossing the main road back to the campsite. 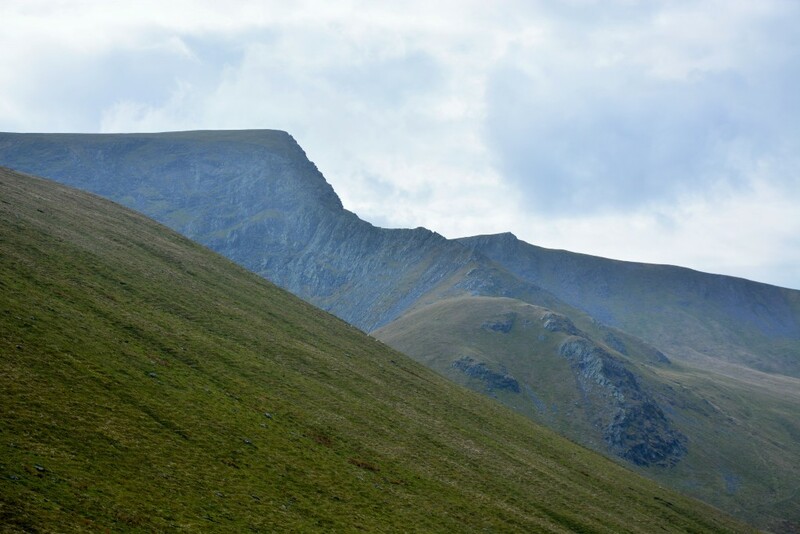 If you don’t want to attempt Sharp Edge – a Grade 1 scramble – follow the obvious path to its left at the small tarn, which takes you up onto the ridge. 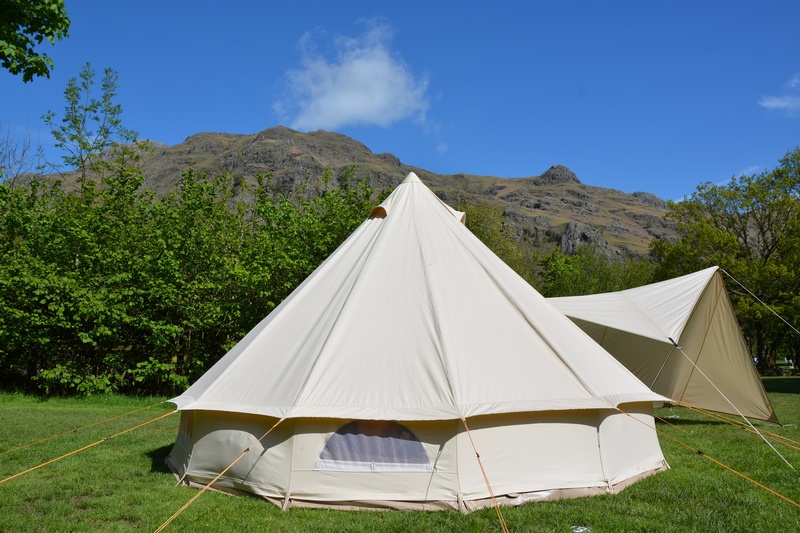 The National Trust’s Great Langdale campsite lies nestled at the heart of the Langdale Valley, and is a perfect base for exploring the magnificent surrounding mountains, ghylls and ridgelines. 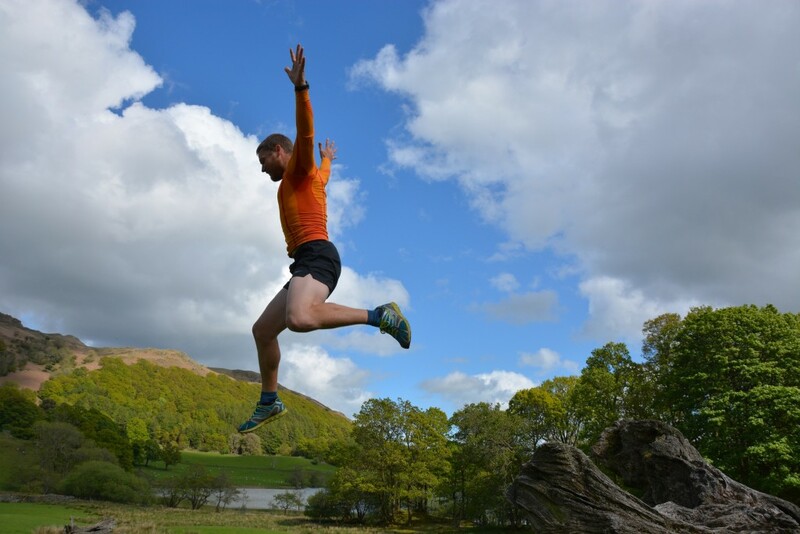 For a truly breathtaking run that takes you to stunning Three Tarns, nestled below Scafell, turn left out of the campsite and follow a path across fields and through Stool End Farm. Continue along the Oxendale valley, past Hell Gill and Buscoe Sike, climbing steeply to reach Three Tarns. From here head north east onto The Band and follow the fine trail all the way back down to the farm and your outward route. Eskdale Camping & Caravanning Club campsite is in a breathtakingly beautiful setting, with classy, spotless facilities and plentiful access to the dramatic surrounding landscape. For a wonderfully varied run turn right out of the main entrance onto a lane to Boot and then left down a footpath to reach the River Esk. Follow the babbling, crystal-clear river eastwards through tranquil woodland, finally winding your way down through a farm to reach the lane again at Doctor Bridge. Just before the Woolpack Inn a footpath heads north uphill to reach Eel Tarn, great rugged running and spectacular views. Turn left at the tarn to head back towards Boot and the campsite. We hope you enjoy our recommendations – please share your fantastic photos with us on Facebook or Twitter.